- Size: Approx. 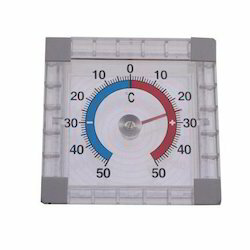 7.5cm x 7.5cm x 2.4cm/ 2.95" x 2.95" x 0.9"
Our firm is providing a wide range of Big Digit Indoor Outdoor Thermometer. Due to high demand, we provide this product in varied specifications that meet on customer’s demand. - Large LCD display with 1″ (25mm) digits. - Simultaneous display of indoor/outdoor temperature. - Indoor Range: 14 to 140°F (-10 to 60°C). - Outdoor Range: -58 to 158°F (-50 to 70°C). 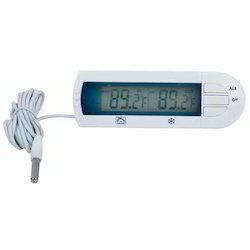 As a noteworthy entity of this domain, we present clients with the premium quality of Indoor Outdoor Thermometers. We bring forth an indomitable variety of Room Thermometer. The product has a robust yellow plastic frame that makes it suitable for indoor and outdoor use. Further, it has Red toluene filled magnifying lens of type imported glass and tubing, which gives an easy reading.